Since 1979, the San Diego workers’ compensation lawyers at DiMarco | Araujo | Montevideo have strived to help people injured while at work. Our goal has been to fairly maximize the workers’ compensation benefits for our clients and help them every step of the way. Let us define what qualifies for workers’ compensation in general. Workers’ compensation injuries include any harm or injury suffered by an employee while in the scope of their employment. In general, there are two types of injury categories: work injuries that happen on-the-job due to a particular sudden occurrence and work injuries that build up over time because of repetitive physical stress, such as leg problems or carpal tunnel syndrome. Workplace injuries also encompass work-related medical issues including: hypertension, trouble breathing, heart disease, stress, or exposure to toxic vapors or toxic chemicals. You are most likely suffering from a developing work injury or a sudden injury. We know that isn’t very pleasant and that relief and recovery is what you want most. We want to be your guide through the complex process. Our hard work on your behalf will give you the time to focus on you and your recuperation from your injury. Whether you have suffered a work injury, amputation, spinal cord injury, or any other traumatic injury from an event at the office, factory, assembly line, construction site or in a vehicle, motorcycle, bicycle, auto or truck accident, allow the San Diego Workers’ Compensation Attorneys to give you the ease of knowing that you, your medical care and your fair legal compensation are going to be taken care of. An experienced San Diego California Workers Compensation Attorney at DiMarco | Araujo | Montevideo to study your injury case for the potential of Third-Party civil claims. Compensation for long term disabilities or injuries that you have developed or had happen to you while you have been working. This is California’s safety net for workers and we believe whole heartedly in the need for this protection. Why Trust Our Work Injury Firm? DiMarco | Araujo | Montevideo has been working for injured people and helping them recover and become whole again since the late 1970s. We have seen almost every type of injury case and circumstance during that time. We will put every minute of our experience to work for you. We know that even though employers are required to carry full workers’ compensation insurance by the employment law, it is not always easy to be awarded your full and fair recovery. Determining your workers’ compensation eligibility and the total value of the compensation you are supposed to get creates complex “grey areas” and legal issues. Your employer’s workers’ compensation insurance company is motivated to minimize the compensation it has to pay to injured workers and the duration for those payments. They naturally use the complicated system to help them decrease their packages to injured workers. Part of this is because long developing work injuries or sudden work injury events are not easy to figure out which parties are to blame and for what percentage of fault. Getting the full and fair compensation you are entitled to typically requires the help of experienced San Diego workers’ compensation lawyers. 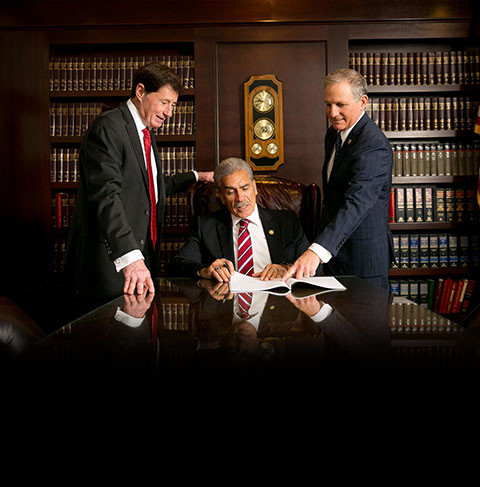 The ongoing job of every attorney in our firm is to stay up-to-date with the ever-changing laws and codes and know how the insurance companies operate. Maximize your State Disability Benefits (SDI) and Social Security Benefits to the top amounts allowed under the law. The San Diego California Workers’ Compensation attorneys at DiMarco | Araujo | Montevideo will be on your side and work to make you whole once more. They will even examine your case for other responsible parties in addition to your employer and place of work. If your injury happened while working but is also due to the negligence of a third party, you may be able to obtain additional compensation beyond that provided by the California workers’ compensation laws. When a Third Party is involved, we will represent you in both a worker’s compensation claim and a civil legal cause of action against the additional Third Party. The Third Party could be another company or person. Work injuries that require our firm simultaneously proceeding with a California workers’ compensation claim and a civil Third Party work injury claim are especially delicate. This is because both claims are intertwined and parallel to each other. A mistake occurring in either claim’s case may cause your options and rights to compensation under both claims to be limited. San Diego California Workers’ Compensation lawyers at DiMarco | Araujo | Montevideo have been successfully working on these workers’ comp and civil work injury claims for over three decades. Most of our clients come to us with a lot of stress, worries and questions. We offer the free initial consultation and case evaluation as a way for you to relax and find answers and reassurance. We will be there for you all the way. For the consultation, you will meet with an attorney who will listen to you, answer your questions and explain how the process works going forward. In addition, until we do our job and win the injury case(s), you won’t be charged any legal fees or costs for our time and assistance. We want you to know that we are ready to meet you at our office, your home or hospital room Monday – Friday 8:30am to 5:30pm. Our San Diego workers’ compensation attorneys know that it can sometimes be difficult and inconvenient to get here during normal office hours. We also are available to meet you in the evening or on the weekends by appointment.If you cannot make it to our office we will come to you. You can call us seven days a week at (619) 946-6466.